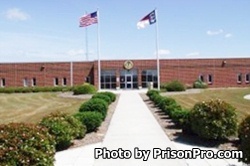 Tabor Correctional Institution is located in West Tabor City North Carolina, part of Columbus County. It is a medium and close custody prison that houses 1,402 adult males. Inmates in all custody levels are housed in single or multiple occupancy cells. Inmates with a close custody status are restricted in the amount of programs they can receive. This facility is relatively new and was opened in 2008. Inmates are provided food, and given basic medical, dental, and mental health services. Inmates at Tabor Correctional Institution can receive substance abuse treatment and obtain a GED while incarcerated.